A custom inground swimming pool with all the bells and whistles can be the heart of your landscape and your lifestyle. The ability to enjoy resort quality amenities without ever leaving home is well worth the expense of going beyond the basic rectangular pool. Today's options are many, including fire features, specialty plaster, space age lighting, artificial rocks, waterfalls and water slides. The latest innovation is acrylic clear walls that turn a part of the pool visible through a transparent window. A gunite pool being constructed. This gorgeous rock swimming pool designed and built by Cipriano Landscape Design illustrates the amazing creations possible when the contractor is highly experienced with artificial stone. The abundant planting shows just how important it is to making the stone feel natural and nestled into the slope. Made from a mixture of cement, sand or crushed slag, and water, gunite provides the interior structure of the pool. It is sprayed over contoured and reinforced surfaces as a lightweight concrete. It is then covered with plaster. This type of pool offers the most design flexibility. 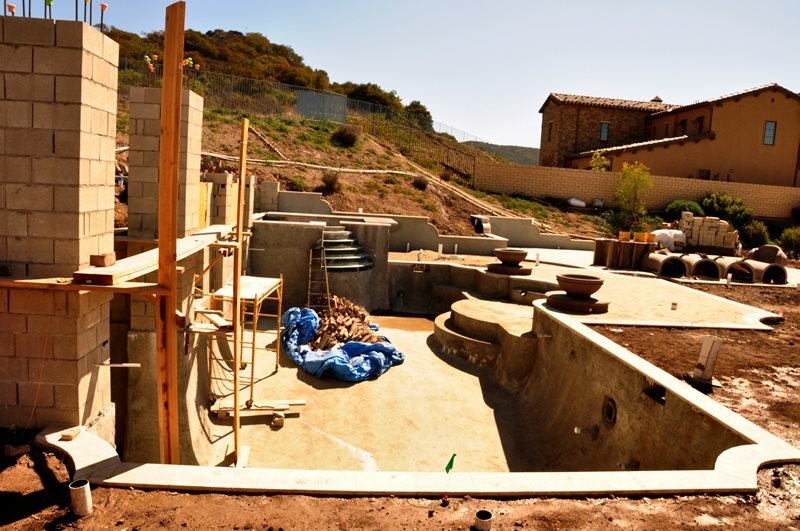 No matter what shape or size, a gunite pool is custom-built and can adapt to any design. 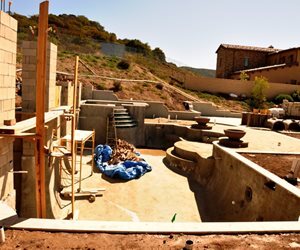 Typical gunite pool installation time is 6 weeks for smaller sized pools or up to 12 weeks. A fiberglass pool is a pre-finished shell that is installed into the ground. Installation requires a professional, but is much faster to install than gunite (typically 1-3 weeks). Fiberglass pools offer a smooth surface that makes maintenance easier than most pools. One downfall is they can crack. 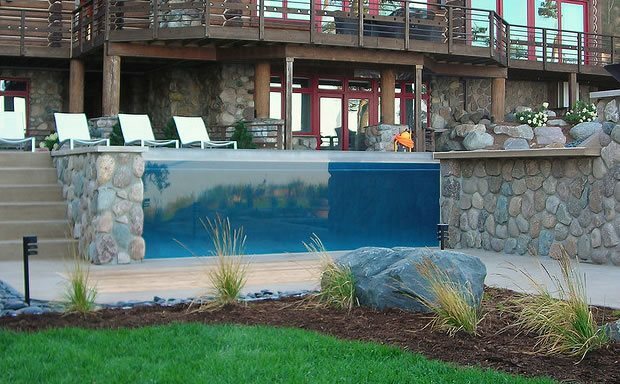 Fiberglass pools come in a variety of pre-formed shapes and styles. Typically the least expensive option for inground pools, vinyl pools have a custom made sheet of vinyl between the water and the pool's structure. Vinyl liners lock in to the pool edging and create a barrier. They are available in dozens of pre-designed shapes. The liners are durable and come in many different colors. Their installation typically takes about 3 weeks. Southern Californians love their fire features close to the pool and Alderete Pools has become the west coast leader of integrating fire and water. Alderete is an innovator of their own unique systems for adding fire in the most challenging and dynamic locations in luxury pool landscapes. 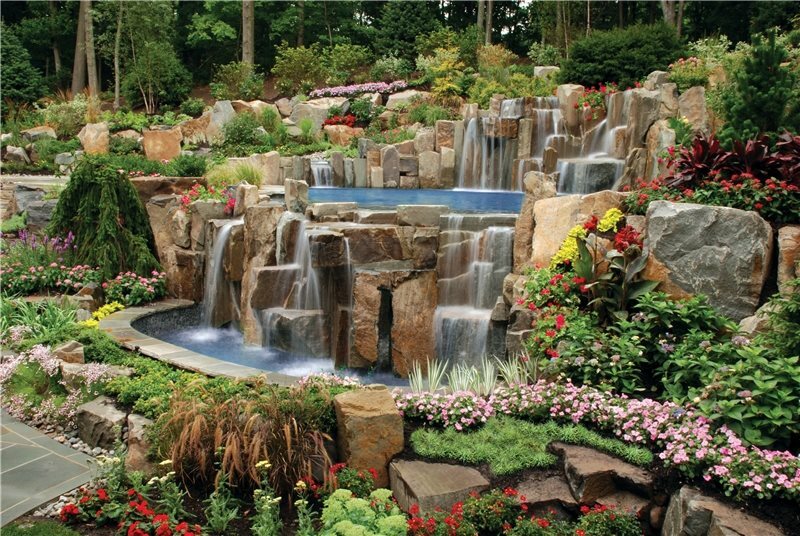 The most expensive and elaborate custom pools are rock and waterfall fantasy designs that can turn an ordinary backyard into a tropical lagoon. These are also the riskiest kind of pool to create if you do not use top notch contractors. In the planning process, a pool designer can draw most amenities exactly how they'll look installed. But since every stone is unqiue, the plans show intent more than actual finished product, leaving the actual placement to the contractor. Only those with vast experience with stone or artificial stone will produce the best work. 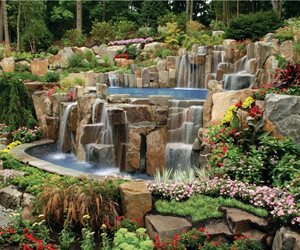 Details are everything in this realm, and whenever possible, integrate your planting design into the rock work to give it a realistic feel. More and more contractors are using artificial stone because it can be created on site for both new construction and pool remodeling and be used rather than hauling enormous weights and setting the boulders with heavy equipment. There are more options in color, size and detailing when using artificial stone which has evolved into a well established art form with some experienced contractors. In general, it's wise to select a contractor skilled in rock work with many built projects to look at before your final decision. 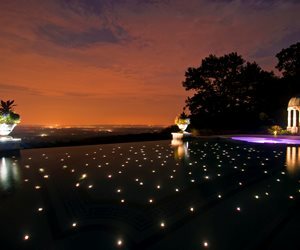 Cipriano Landscape of New Jersey are masters of unique luxury pool lighting effects. In this pool fiber optic fixtures are worked into the pool bottom to create a starlight effect that allows pool water to meet the night sky's stars seamlessly. Water and fire are powerful forces in nature. Water is a daylight element, fire is best experienced at night. Therefore the latest trend in custom pools includes the creation of fire features as close to the waterline as possible. Whether it is a strong architectural modern landscape or a naturalistic rock and waterfall wonderland, adding a fire feature may be the most affordable way to give your project something special for those night time swims and poolside parties. There is no denying the unique dynamic that results when fire features are integrated into custom pool designs. In southern California fire features are used year around. "We're doing a lot of fire features right now. Our customers want fire on the water or behind it for an accent. We manufacture our own systems so every project is unique to our company." The development of LED and fiber optics has thoroughly transformed the custom pool lighting options. 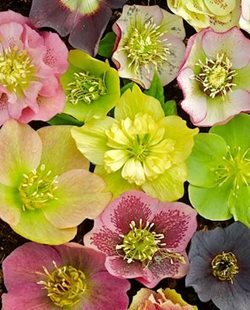 Not only are these capable of amazing effects, they help to solve problems such as short bulb life and building code limitations. 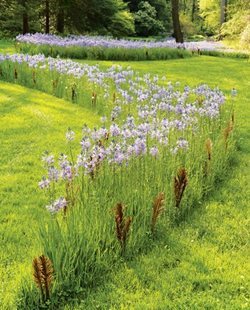 Chris Cipriano of Cipriano Landscape Design of New Jersey is renowned for creative effects. "Lighting is crucial to opening up the real depth of the backyard after dark. We use colored LED lighting in thee pool, with fiber optic in the pool and in waterfalls. We are currently working on a custom pool in the shape of a violin with 600 strands of fiber optic lighting for the strings. It allows us to syncronize the lighting with a state of the art underwater audio system. We also created a pool bottom studded with hundreds of tiny lights so that after dark it becomes an extension of the night sky. Expect a 20 to 30% markup on the pool for these kinds of effects which are very labor intensive and fragile during construction." 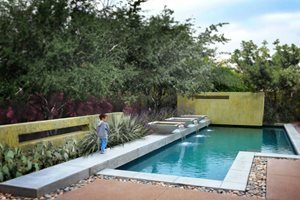 Landscape architect Ive Haugeland of Shades of Green in the San Francisco area is an authority on sleek modern pools. "One pool we're doing right now is designed for lap swimming at night. We've installed a lane line onto the bottom with self glowing tiles so the owner can swim laps in the dark without illuminating the entire pool. We try to use LED as much as we can, often under the coping or in the water itself." 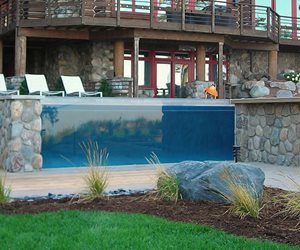 The newest feature of custom pools and is a thick clear acrylic wall shown here in a project by Apex Landscaping of Grand Rapids, Michigan. This example shows how this effect is most often seen on multilevel projects. Clear wall pools and spas are the latest innovation in luxury custom pools. "In Newport Coast, we're doing a spa with glass tile and a clear wall with LED lighting. It looks like an aquarium, especially at night. We often build these with a vanishing edge at the top," says Alderete. This new technique drawing upon thick acrylic panels developed for large aquariums is a perfect fit for multilevel sites that make the clear wall a more logical part of the design. Filtration systems are crucial to this custom pool option so that the tiniest particles are removed for a perfectly clear body of water. The problems of stains and algae in traditional pool plaster were improved with Pebbletech, a plaster alternative that binds tiny pebbles into a resin to coat the inside of your pool. It began as the ideal plaster for rock or naturalistic pools so the palette can extend underwater. It's an exceptional choice where shallow beaches or Baja shelves where the pool bottom is visible through very shallow water. It's also ideal for lining waterfalls and spas. Now the latest thing is Beadcrete which is similar to Pebbletech but instead of small stones it uses small glass beads in a polymer resin. The beads are much smoother on the feet which is very important to more sensitive pool users. However, it's the reflectivity of the glass beads that offers a beautiful, bright sparkling plaster that is remarkably beautiful under LED pool lighting. 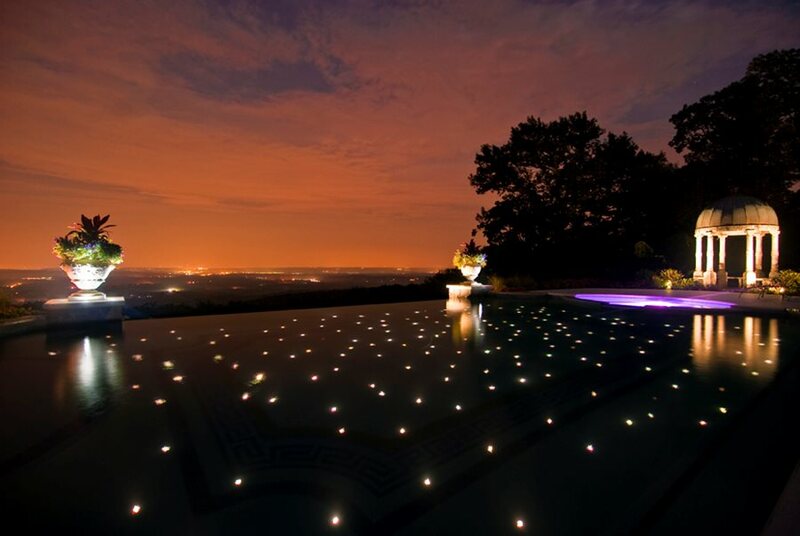 Beadcreate is a superior choice for modern pools or for enhancing lighting effects in special custom water features. Pool covers are an excellent way to reduce maintenance. They also add to the safety of a pool Haugeland says. 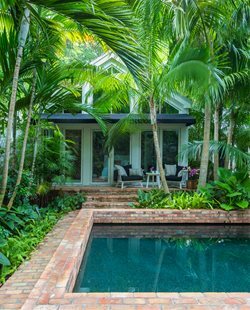 "The rectangular look of the modern pool is the most practical shape for today's landscapes. It's particularly well suited for pool covers that provide security and heat retention and cleanliness. We design a lot of under coping roll up covers, which are least in the way and easy to use. The whole site looks much cleaner and tidier when the cover is visible. We recommend customers choose a color for their cover that most closely matches their water color so when in use the site design remains consistent." One of the most important new introductions to the custom pool market is SonarGuard, which is part of the Cipriano luxury pool options. "Owners that insist on safety without a cover can opt for a system designed to detect the fall of a child or pet into the swimming pool," says Shea Cipriano. "SonarGuard provides the ability to detect a disturbance within a pool or spa of any size or shape with only one system. With the accuracy of this system, homeowners find security in the ability to differentiate between pool toys and a child mistakenly falling into the pool. When the alarm mode is set, an underwater sensor creates an invisible net. Breaking this net then signals an alarm allowing maximum time to assist any victim."